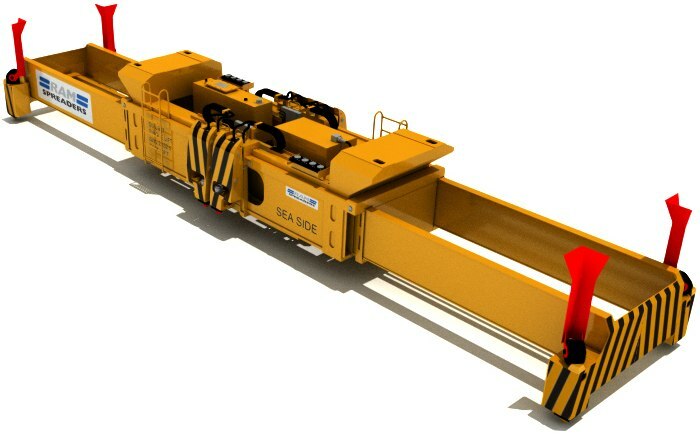 The RAM 2900 Series for use on Ship to Shore Cranes is designed in accordance with DIN 15018. Manufactured from high quality steel and components, the spreader provides robust and reliable operations in demanding container terminal environments. The spreader can be designed to interface with new or existing crane headblocks and electrical communication systems. The spreader is electro-hydraulically operated with all functions of the spreader controlled from the crane operator’s cabin. The spreader is capable of handling 20ft/40ft/45ft single containers. Retractable twin lift housings allow the spreader to handle two 20ft containers in twin lift mode. When operating in twin lift mode the RAM ‘CentreSpread’ function allows the spreader centre gap to be adjusted allowing two 20ft containers to be handled which are not set at the standard centre gap distance. The standard centre gap of 76mm can be reduced to zero or increased to 1600mm (5’3”). The centre gap can be adjusted when the spreader is either unladen or is lifting two 20ft containers. The spreader is fitted with a memory positioning system and automatic positioning system which enable the spreader to “memorise” the gap between the two 20ft containers. High torque hydraulically retractable gather guides are fitted to each corner to aid alignment to the container. ISO floating twistlocks allow the crane operator to quickly locate and lock the spreader onto a container.